By now, readers of my Back Story have probably concluded that what Amy and I need is a dog of our own. Mindless of our oft-violated no pet policy – countless chickens and house birds over the years and frequent overnight visits by our daughter’s dog – we found ourselves making weekly visits to the adoption people at Petsmart, and even went to take a look at Roscoe, a local dog that was being given away. Our last Petsmart foray was a week ago Saturday, and there were three or four 12-week-old pups we liked, all spayed or neutered and with all their shots. One little fellow in particular caught my eye. We decided to be smart and think about it over night. But it seemed like we had already made up our minds. Amy kept reminding me how having Granddog over for a week had provided me with so much healthy exercise. And on Sunday, she pushed for an early trip to the Caesar’s Creek Flea Market for some inexpensive dog supplies. It seemed like a done deal. I was just concerned that the puppy I liked would be gone by the time we finished in Caesar’s Creek and made it over to the Petsmart at Beavercreek. Before we even made it to the cheap pet supply store, we came upon some folks who were selling purebred puppies. In one cage were two sleeping fuzz balls. “Oooh, so cute,” Amy squealed. 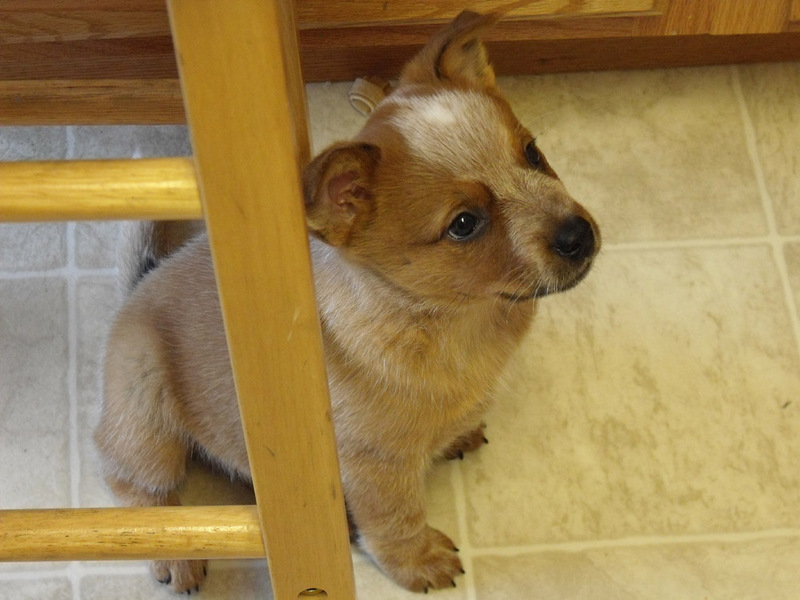 And that is how we came to be owned by an eight-week-old Red Heeler Australian Cattle Dog we call Suki. This is not exactly the dog I had in mind for hanging out on the bench in front of Tom’s Market. By the time the weather is good enough for that, she will be about six months and nipping at the heels of passers-by and ready to protect me from any dog that happens along. A little quick research after we got home and I learned that that the breed was originally started by breeding the Australian Dingo with a variety of sheep dogs. Dingos...? Aren’t they wild dogs..? Indeed. This little bugger growls and snarls and nips our toes. My hands are covered with marks from where she has clamped down with her sharp little teeth. She is smart and athletic. She can escape from just about any enclosure we can devise. She can already jump several inches in the air. But she is our little Dingo and we will manage. First in order of business will be obedience classes. After that there will be lots of long walks to wear her out. Actually, it’s not all that bad. She sleeps a lot; sometimes in my lap. Oh, my gosh she IS so cute! Congratulations, Virgil and Amy. I look forward to seeing you and the puppy downtown. How does she like the snow? We haven't really had her out in the snow, but she looks out through the big glass sliding doors onto the deck and, when we go in and out, she sticks her nose out and tests it. She thinks it's fun. Congratulations. Here is a good link for you: ACD FAQ. Owning a dog which sheds incredible volumes, I was curious to discover that the Australian Cattle Dog only sheds once or twice a year. However, when it does shed the describe it as "blowing it's coat". I can't wait to hear what that looks like. Thank you for adopting her. I hated myself all the way home on Saturday when I left the flea market for leaving her there. I have a 4 year old Red female and they are so smart and always ready to play. Chewers yes, but give them their own chew baby. Thank you I am so relieved. Mike: Thanks for the link. We'll have you over for a "blowing her coat" party when it occurs. I'm sure you would like to see it close up. Toad Hall: What a coincidence! I'd like to talk to you more about your dog. Can you send me your email address to gunchpress@yahoo.com? Thanks. Thanks, Tom. This is interesting. There is much more known about these dogs in our community than I would have imagined. Fortunately, the chickens are fenced in. I wonder how she is going to react to the cattle across the road on US68. I have little personal experience with this breed, but imagine herding animals ten + times your size! This breed must have some moxie! I suggest getting a rechargeable wet/dry hand vacuum- very handy for cleaning up "accidents". Also, never too early on obedience training. Ask Barb Mann regarding puppy training. Also get those chew toys soonest- and enjoy! Great dogs. If you have her spayed she will only shed vigorously once a year, but I brush Molly from April to October once a day. She lies it and will always sit still for it (or it could be the little dog treats she gets for being good). Smart. Smart. Smart. One thing, when her neck ruff goes up, keep an eye on her. She may not trust who she is looking at. I always introduce friends and let her smell them. They like to lean in and get smell. They are pack animals to the last, but you are the leader as Caesar says. Great dogs.